The extreme heat is sucking life from North Texas ponds and lakes. Water levels are down, and fish are dying by the hundreds in some bodies of water, such as Twin Lakes Estates in Denton County. "On Monday, I came outside to let my dog out, and I noticed a lot of vultures along the bank of the pond," Twin Lakes Estates resident Missy Dawson said. "I noticed a dead fish floating here, and I thought, 'That's hundreds of fish, belly-side up.'" Walt Overton, who manages stock lakes and ponds across the state, said his company gets calls weekly. Th drought is drying up area ponds, affecting wildlife in the process. "People are saying, 'What do we do? What do we do?' A lot of times, there's not too much," he said. "By the time you see the problem, it's too late. We have been better off than the rest of the state, but now, we have a lot of ponds in this area that are down at least 50 percent." With little oxygen and water temperatures above 90 degrees, fish have little chance of survival, Overton said. 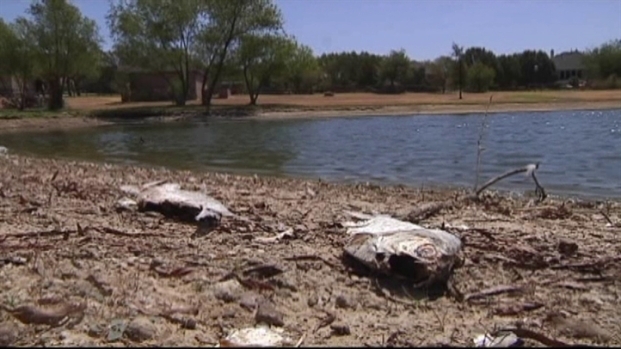 Wildlife experts say fish can be in trouble long before the water in the ponds is gone. "There is just not enough dissolved oxygen to support the life in there," Overton said.